I spent the day giving my apt a MUCH needed deep clean and could not have done it without my vacuum. I vacuum everything: curtains, blinds, window sills, surfaces, radiator, books (how else can you clean the edges? ), the shoulders of coats, hamper, document boxes, pandan boxes, tweed boxes and carved wood jewelry box, shoes, keyboard (turned off), furniture, baseboards, bare floors, and of course the rugs. The attachments are so easy to use and the little canister is so easy to maneuver around and pick up when necessary. So I’m always so surprised by clients who only have a little dust-buster, not a vacuum. They give the same “I don’t have carpet so I don’t need a vacuum”… Is it just me? It's not just you! We did so much crafty stuff to get a Dyson Pet Edt. vacuum when we got married and I'm glad we did. We had full carpet then, but I use it on our bare floors. I vacuum all kinds of nooks & crannies high and low with it. I wish I had some amazing tip to offer here! I vacuum a bit obsessively. At least two or three times. I have carpet, but it's light-colored, so I could get away without vacuuming so much, but I like to. It always looks so nice and fresh after a good carpeting! I'm glad to hear I'm not the only one who vacuums books. I learned that vacuuming is a healthier way to clean whether or not one has carpet/rugs; since sweeping raises dust, allergens can cause a sufferer more harm while cleaning. I have a little (lightweight) vacuum because 90% of our home is rug free but I am on the lookout for something even stronger. The other attachments are wonderful to use on all areas mentioned. I vacuum everything too, even the wood floors! There's this attachtment-thingie especially for tile and wood floors, so you don't scratch anything. I coulnd't live without a vacuum! 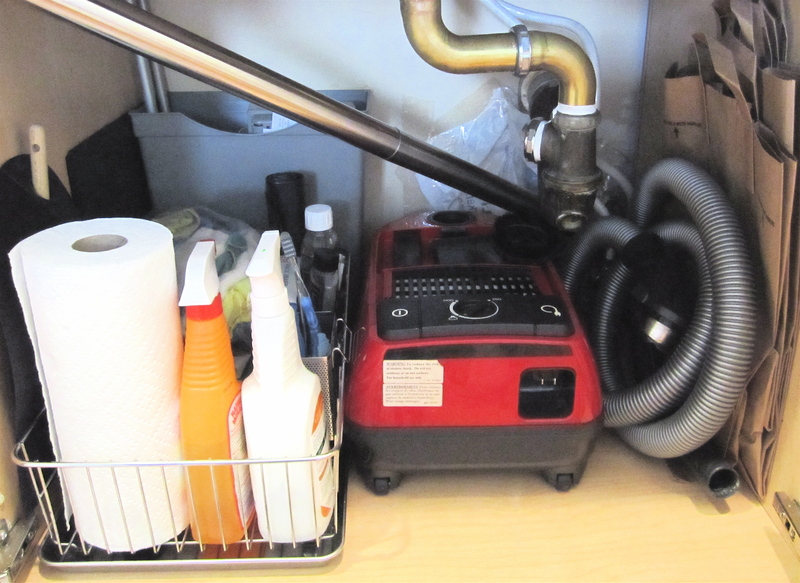 Can you recommend any vacuums for a small studio apartment? i love the miele olympus canister vacuum, it's about $300. you don't need to get any additional attachments that they try to up sell you. some of my clients have the small sharks (brand name) but to me, i couldn't live without the miele… to me, it doesn't matter the size of the space or if you have a rug. this vacuum may sound like a lot of $$ but it should last you for years and years to come and what's more important than a clean home? I have been searching EVERYWHERE for round pandan boxes like the ones you have. Where did you get them?